Part 1 Oxidation in foods and beverages: Understanding oxidation processes in foods; Metals and food oxidation; The impact of singlet oxygen on lipid oxidation in foods; Heme proteins and oxidation in fresh and processed meats; Lipoxygenase and lipid oxidation in foods; Understanding and reducing oxidative flavour deterioration in foods; Health aspects of oxidized dietary fats; Methods to determine the extent of lipid oxidation in foods; Methods for food shelf life determination and prediction. Part 2 Antioxidants in foods and beverages: Understanding antioxidant mechanisms in preventing oxidation in foods; Protein antioxidants for the stabilisation of lipid foods: Current and potential applications; Synthetic and natural antioxidant additives in food stabilisation: Current applications and future research; Effects of food structure and ingredient interactions on antioxidant capacity; Assessing the activity of natural food antioxidants; Effects of processing and storage on antioxidant efficacy in foods. Oxidative rancidity is a major cause of food quality deterioration, leading to the formation of undesirable off-flavours as well as unhealthful compounds. Antioxidants are widely employed to inhibit oxidation, and with current consumer concerns about synthetic additives and natural antioxidants are of much interest. The two volumes of Oxidation in foods and beverages and antioxidant applications review food quality deterioration due to oxidation and methods for its control. 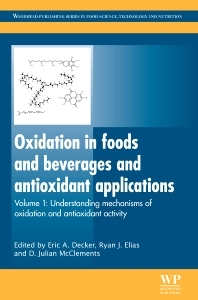 With its distinguished international team of editors and contributors, the two volumes of Oxidation in foods and beverages and antioxidant applications is standard references for R&D and QA professionals in the food industry, as well as academic researchers interested in food quality. Ryan Elias is Assistant Professor of Food Science at Pennsylvania State University. He is well known for his research into lipid oxidation and antioxidants. Professor David Julian McClements works in the Department of Food Science at the University of Massachusetts, Amherst. He is well known for his research into lipid oxidation and antioxidants.